The problem of toxic substances has roots that can be traced back through the organizational levels of industrial systems: from the design and manufacture of products to the design and manufacture of the materials from which products are fashioned, and ultimately to the level of chemical production and molecular design. The results of design and engineering decisions at each level are taken up as finished products for use in ‘higher’ levels of design and engineering. Product design rarely involves creating new materials or synthesizing new chemicals; rather, it most commonly involves selecting among available existing materials. Those materials, in turn, are made of chemical ingredients selected from already-available options. To a large extent, the entire chemistry-based system of production is shaped by the available transformations of mineral and petrochemical resources. This view highlights a multi-level hierarchy in the way things are made—we might call it a design hierarchy, illustrated here with the example of a hypothetical PVC-containing building product. We can use the design hierarchy to trace the decisions that have led to the presence of toxic chemicals in products, and to identify opportunities for substitution. This concept is adapted from the ‘nested relationship’ of chemicals, materials, and products that the Lowell Center for Sustainable Production articulated in their Alternatives Assessment Framework. That relationship expressed a hierarchy of inclusion: “products consist of materials and/or chemicals, materials consist of chemicals, and chemicals are constituents of materials or products.” The design hierarchy also expresses the relationships of different actors involved in designing technological artifacts and systems—and these relationships are interesting from the perspective of systems change. As we follow toxic problems deeper into the design hierarchy, the main actors at each level—the designers, engineers, and manufacturers who make each discrete item what it is—become further and further removed from each other and their respective design goals and knowledge networks. For example, it’s difficult for architects who want to design ‘green’ buildings to influence what goes on in the domains of materials science and chemistry. They lack the resources and technical expertise necessary to delve into issues of the molecular composition of products, and they can’t easily modify products to make them less toxic. Designers could try to select safer products, by asking what alternatives are available and how these compare in terms of environmental health impacts. But answering such questions is a challenge in itself. There are structural and organizational barriers to information flow in supply chains, especially across different levels of this hierarchy. For any given item, there may be a complex, globally-distributed network of suppliers; who is responsible for its chemical makeup? For that matter, what is its chemical makeup? Product makers don’t necessarily even know. Concerns about chemical risks upstream in the supply chain are simply not negotiable in markets where detailed knowledge of product chemistry is lacking. Specialized groups of design professionals could take on the challenge of developing innovative technologies that are inherently benign. At the chemical and material design levels, this corresponds to green chemistry and green engineering. Green product design is even more complex and nebulous. Proponents of clean production can develop green design tools—decision support tools intended to inform and guide users in the technical aspects of eliminating toxic substances. 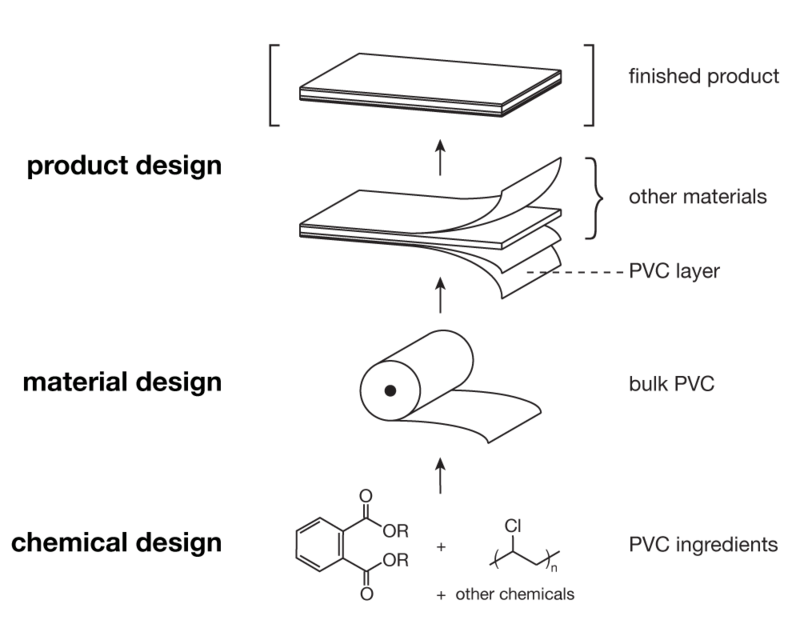 Green design tools have been developed and used at all levels of the design hierarchy: to reduce the environmental health impacts of the synthesis and properties of molecules (e.g., the GreenScreen), to optimize the chemical composition of materials and the manufacture of parts and components (e.g. the Sustainable Apparel Coalition’s Higg Index), and to select safer and less environmentally costly products (e.g. Healthy Building Network’s Pharos Project). Different kinds of expertise, and different design tools, are brought to bear at each level. The idea is that well-informed decisions may, in aggregate, help shift production systems to more sustainable trajectories. Stakeholders can advocate for greater access to knowledge of the chemical constituents of products and materials—in other words, transparency of chemical information—to support informed design choices. This idea has gained considerable traction in the green building space, through projects like the Health Product Declaration open standard. Meanwhile, broader initiatives like the BizNGO Guide to Safer Chemicals and the Chemical Footprint Project aim to help companies address systemic problems of supply-chain chemical management. This post originally appeared on the author’s personal blog and is reposted under a Creative Commons Attribution license.